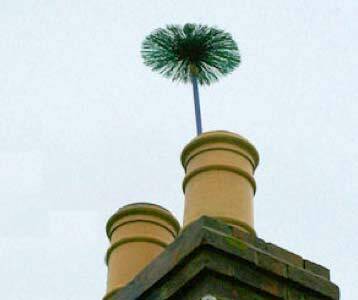 Let's go back to basics - why do you need to sweep your chimney? To avoid a chimney fire- according to statistics there are on average 7000 chimney fires a year in England alone, most of which were preventable. Having your chimney swept will drastically reduce the chances of having a chimney fire, also insuring the wood you are burning is dry and has a moisture content of below 25% will help further reduce chances of a chimney fire. Avoid Smoke damage- every time your stove is lit soot will accumulate up the chimney. 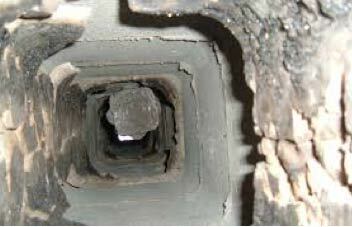 If this goes uncleaned this will gradually reduce the size of the flue and in turn reduce the draw of the smoke upwards. If this flue is reduced too much this can cause smoke to enter the room which can cause irritation and blacken up the fireplace. Clearing Blockages- Sweeping a chimney will also ensure the safe removal of obstructions that may have lodged inside the flue such as nests, cobwebs, Flue collapse (loose brickwork), which could obstruct the safe exit of fumes. What are the advantages of flexible chimney rods compared to conventional sweeping rods and brushes? Flexible rods are able to bend upto 180° meaning they can get in the tightest of flues. What happens if I burn unseasoned wood? Burning wet or unseasoned wood should always be avoided, the main reason for this is as the gases rise up your chimney stack, the moisture in these gases condensate on the inner walls of the chimney stack and set as a hard tar. This is in most cases will not be able to be removed and if built up could catch fire leading to a large chimney fire. Burning wet wood also gives little heat and may spit sparks into the room. You can avoid the risk of burning wet wood by buying a moister meter, this way you can reject damp wood. The wood you burn should not have a moister content of over 25%, anything higher will cause excess build-up of tar and creosote. Use only recommended fuels for your appliance and flue type (If you are unsure check your manufactures instruction or ask your stove supplier). 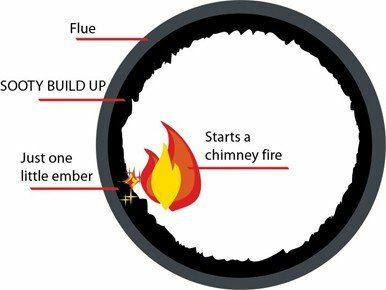 What causes a chimney fire? What should you do if you have a chimney fire? In the event you have a chimney fire evacuate the building immediately and call 999. Do not use your chimney again until it has been assessed by an appropriate specialist such as a Hetas registered or NACS registered engineer. There are reasons to get a trained professional to sweep your chimney, particularly if you have any kind of safety concern or you need an insurance certificate, however it is something that you can certainly do yourself. There are two approaches to sweeping a chimney with rods; you can insert the rods at the bottom and push them up or you can do it the other way by pushing the rods down from the top. Here we’ll describe the “bottom to top” method as it is easier and shouldn’t require clambering about on the roof. A word of warning here is to make sure you do not try to sweep the chimney for at least 12 hours after the fire has gone out. Soot can stay hot for a long while. Ensure you purchase the right size brush, we recommend at least ½ an inch (15mm) wider than the chimney. Sheet up – Put your old bed sheet against the fireplace opening. Tape the top of the sheet to the fire surround – only the top at this stage as you will still need to get the brush in there! If you opt for screw rods, use a good quality ¾ inch drain, or chimney sweeping rod set and affix the brush tightly. The rods will screw together in a clockwise direction so, when turning the rods as you push the brush up the chimney, make sure you turn in a clockwise direction. Push the rods up the chimney so that the brush sweeps all the way to the top. This will keep the joints on the rods tight. If you twist the rods in an anti-clockwise direction there is a good chance you will undo a joint and get the rods and brush stuck up the chimney. Using one rod with the brush on, push the brush up the flue. Twist slightly (in a clockwise direction) until you can only see 300mm of the rod. Attach another rod and repeat. Do not attempt to push too hard. Just a little at a time will dislodge small areas of soot and this will be much easier to manage than a lorry load pouring down all at once!